Styled after aircraft panels and gauges. Set your time zones 1 and 2 in Watchmaker settings, and the zone names on the dual time dial will change names. The border between the orange and blue arcs on the 24 hour dial shows sunrise sunset. The moon phase is in the center of it. The battery dial is inspired by dual guages in twin engine planes; temp and humidity is in the center of it. Upper right is wind speed in orange and white is direction. Ambient mode is same as bright. INFO button is lit green when you have calendar events. CHRN button is lit green when chronometer is running. Watch has three screens. 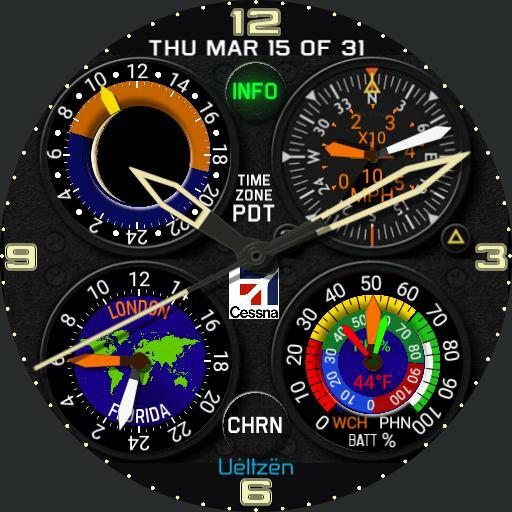 Watch, chrono, and info with events and weather.